While street names reflect a neighborhood’s development, social history more often relies on residential women who have reached back and gathered stories of their elders. Woodland is lucky to have life-long resident Diane Oesterreich, who took the time in the 1980s and 90s to record and transcribe interviews with many elderly (now deceased) residents who remembered the early days of Woodland. These oral histories have been gathered in an unpublished manuscript titled “At the End of the Carline,” and she was generous enough to share it with this author as a resource. The photos that appear with this story were also provided by Diane. Originally called Woodland Park, Woodland was so-named for the obvious reason that it consisted of mostly uncleared forest when the property was sold by Guilford Hartley to real estate men like Francis Colman and Ole Kolstad, both of whom developed the neighborhood and have streets named for them there. A major catalyst for this development was the heavy investment made by the capitalists of the Motor Line Improvement Company, most of whom also owned real estate all along Woodland Avenue from the present-day Mount Royal area through Glen Avon, Hunters Park, and on up the hill to Woodland. These investors wanted their land to be valuable, and thus they had to make it accessible. So they ran a single-track electric streetcar from Fourth Street at Twenty-fourth Avenue East (the same route now taken by the #13 bus, excepting the UMD loop) to Forest Hill Cemetery; it was later extended to Austin Street. As in Duluth’s other developments, once the car line was in place, its operation was turned over to the Duluth Street Railway Company. In Hunters Park, the streetcar line was served by a waiting station at 2012 Woodland Avenue (corner of Lewis Street), now a private home described as a Queen Anne cottage. Another stood along Woodland between Austin and Red Wing Streets, the site of a Super One grocery store parking lot today. 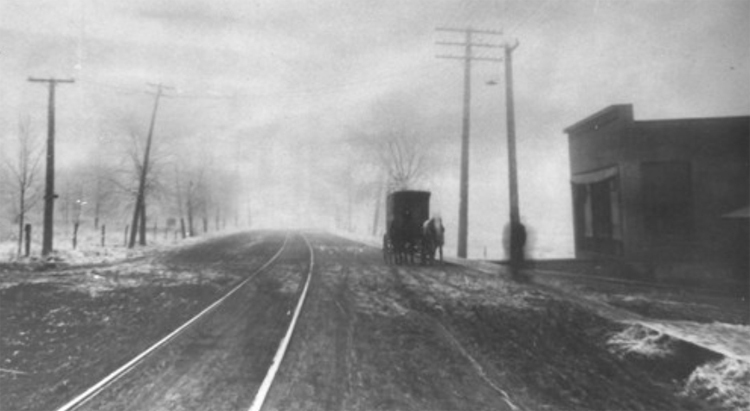 The car line first ran on April 20, 1891, and it quickly became the primary mode of transportation for everyone from the genteel residents of Hunters Park to the more rural folk of Woodland Park. One of those streetcar and real estate investors was Guilford Hartley, whose huge Allandale Farm occupied the property covering today’s Hartley Nature Center. Before it was forfeited to the city during the Depression, the farm was most famous locally for its huge fields of lettuce and celery. In fact, Hartley is partly credited with making celery an American dietary staple. As a family and business, the Hartleys dominated the Woodland social scene—even though the Hartleys themselves did not live in the neighborhood. Early residents often found work on the farm, if not as common laborers (including Japanese immigrants recruited from western states), then as foremen and managers. Children who grew up in Woodland when Allandale was an active farm especially remember a tree stand that had been erected on a very tall pine in the middle of the property, a hundred feet or more up, where all the family would go to survey their holdings and perhaps shoot a few deer. In 1892 Hartley built the Duluth Driving Park, a horse racing track and the main reason the streetcar route was extended to Woodland. The driving park’s buildings were designed by prominent Duluth architects Oliver Traphagen and Francis Fitzpatrick. On opening day, September 20, 1892, it attracted 2,500 people, many of whom were delayed by the streetcar’s struggle getting up Dairy Hill, a steep, winding part of Woodland Avenue so-named for the dairy that once stood where Concordia Lutheran Church now stands. You know where Rendle Avenue is? That was part of it. Owatonna Street is the other part. Wabasha was the other. What should be the alley between Mankato and Wabasha was the south bank of the track. There was a slough in the middle of it with cattails. [ … ] Sometimes the streetcars were so filled with people to get to the racetrack that they had some riding on the roof. They stopped racing about 1911-1912, along in there, because it burned down. Some of the local boys around here had something to do with it burning.